PROJECT TITTLE: MULTIPURPOSE AUTONOMOUS SYSTEM FOR DIFFERENT ENVIRONMENTS AND ROLES. / VEHÍCULO AUTÓNOMO MULTIPROPÓSITO PARA DIFERENTES AMBIENTES Y ROLES EN OPERACIONES OCEÁNICAS. 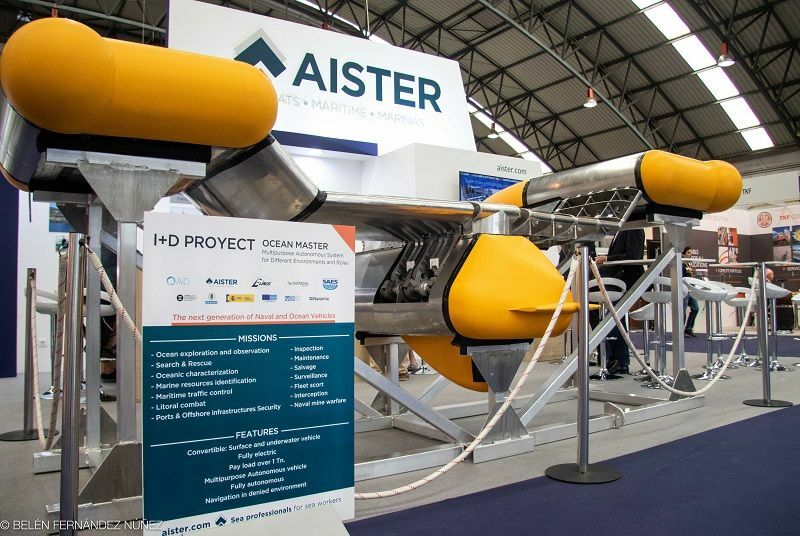 The company AISTER, located at Vigo’s bay, is participating in the Ocean Master project, in which a multi-purpose autonomous vehicle for differents environments and roles will be developed. The main objective of the Ocean Master project is to design, develop and validate an unmanned multipurpose marine vehicle capable of performing missions in complex and highly environments. In this way, a new generation of disruptive vehicles capable of providing great capabilities to its users, civilian or military, would be developed. Some of its missions are ocean exploration and observation, search and rescue, oceanic characterization, marine resources identification, maritime traffic control, litoral combat, ports & offshore infrastructures, security inspection, manteinance, surveillance and interception. The aim is to take advantage of the know how existing in naval, electronic and electrical industries, as well as auxiliary business of these sectors, so that all of them can also reactivate their activity and propelling the creation of new products, processes and services of strategic interest for the sectors mentioned. At the same time, the Ocean Master project, will boost the leadership and international positioning in the sector of unmanned marine vehicles, generating wealth and employment in the Spanish industry. ELINCO has a team of high quality professional technicians and experience to develop projects. Specializing in the design and execution of all types of electrical installations, the production of electrical panels, command and repair consoles for electromechanical equipment and products or services aimed at naval and industrial sector. GHENOVA is an international multidisciplinary engineering that participates in large projects of high technological complexity for some of the world’s largest companies in the naval and offshore oil & gas, industry and energy, infrastructure, aeronautics and defense sectors. In nine years of history, Ghenova has positioned itself as a reference engineering in Spain, a company recognized in Europe and succesfully established in Latin America. SAES is a highly specialized and internationally recognized company in the fields of electronics and underwater acoustics. Its main objetives are the desing, manufacture, assembly, installation, repair, manteinance, import, export and distribution of equipment, tools and electrical, electronic and acoustic equipment focused on underwater needs. AISTER is a company specialized in marine aluminium sea works focused on Workboats, Maritime shipbuilding and Marinas. The aims of the company are the best building quality and constantly innovation in their activities: aluminium shipbuilding, marine interiors and marinas. OCEAN MASTER project has been selected in the FEDER Innterconecta 2015 call and is co-funded by CDTI (Ministry of Economy and Competitiveness) and FEDER funds, throughout the Operational Programme for Smart Growth 2014-2020. It is developed in the regions of: Andalucia, Galicia, Madrid and Murcia by a consortium composed of the companies: ELINCO, AISTER, GHENOVA, AID and SAES. The end of the project is scheduled for March 2018 and its overall budget is of 2.138.782 €.